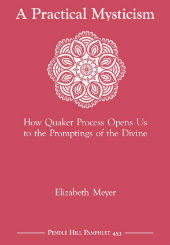 Quaker business process is a group practical mysticism that opens the worshiping body to the promptings of the Divine. At its best, all in the worshiping community—not only the clerk—understand and trust the process. This essay identifies twelve Friendly practices, aspects of Quaker process that, when faithfully adhered to, deepen our worship with attention to business and invite the work of the Divine Presence in our midst. Discussion questions included. Click here to read a review of this pamphlet by Marty Grundy, Friends Journal.